Good morning! I hope you enjoyed all of the Valentine's Day Projects we shared last week. The Design Team is back this week and we have some amazing inspiration to share with you. 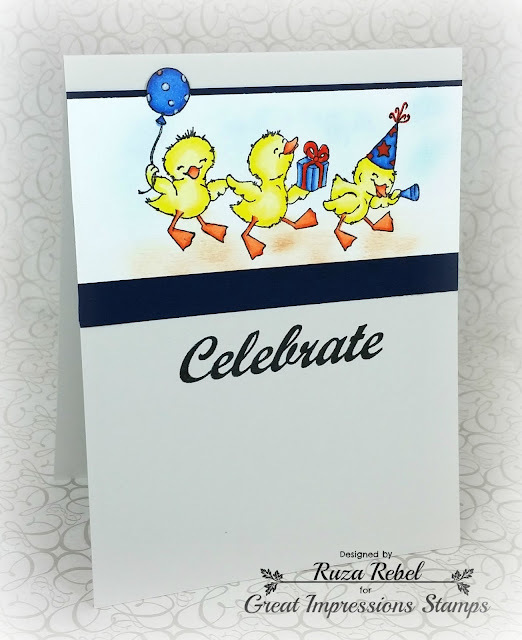 Today I'm sharing a birthday card featuring the adorable Party Ducks (G458) from Great Impressions Stamps. I absolutely love the adorable Party Ducks and couldn't wait to play with them. I stamped the Party Ducks with Memento Tuxedo Black Ink, colored them with Copic Markers, applied distres ink for the ground cover and sky, and then cut out the panel with the balloon flying above. I layered the colored panel on blue cardstock, and then added it to my grey cardbase. The Celebrate Sentiment is one of the retired stamps by Great Impressions. 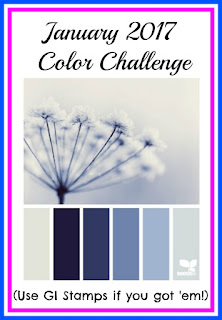 You have one more day to join in this months Great Impressions Color Challenge. I hope you stop by for all of the details, join in the FUN! Good morning! This week we are Revisiting Valentines Day Projects created by various Designers. Today's project was created by Mynn and features the lovely Forever Yours Sentiment (E859) available at Great Impressions Stamps. Mynn's card is so elegant and beautiful. I love how she combined the DP, stitching, and all of the beautiful layers to feature the sentiment. The Design Team will be back on Monday to inspire you with lots of beautiful projects. You still have time to join in our Great Impressions Color Challenge. I hope you stop by for all of the details, join in the FUN! Good morning! This week we are Revisiting Valentines Day Projects created by various Designers. 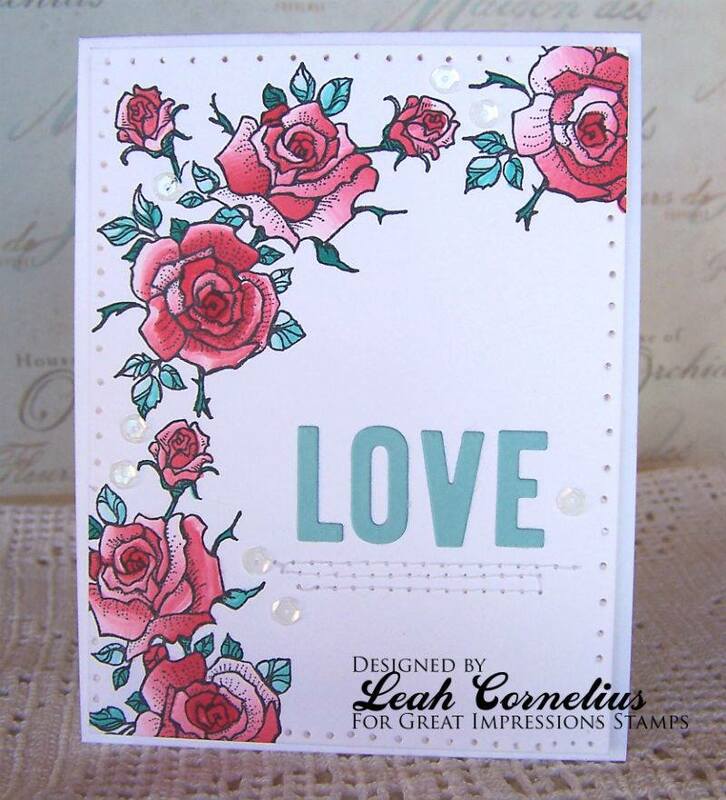 Today's project was created by Leah and features the lovely Rose Trio (G454) available at Great Impressions Stamps. I love how Leah created the border using the Rose Trio. She did a beautiful job coloring the roses, add in sequins, LOVE die sentiment and stitching to create an elegant card! Good morning! This week we are Revisiting Valentines Day Projects created by various Designers. Today's project was created by Lorie and features the adorable Spikey the Porcupine (D474) and Happy Valentine's Sentiment (D4747) available at Great Impressions Stamps. I love how Lorie colored the adorable Porcupine, and how she put the sentiment above him. What a perfect gift tag for the soap! Good morning! This week we are Revisiting Valentines Day Projects created by various Designers. 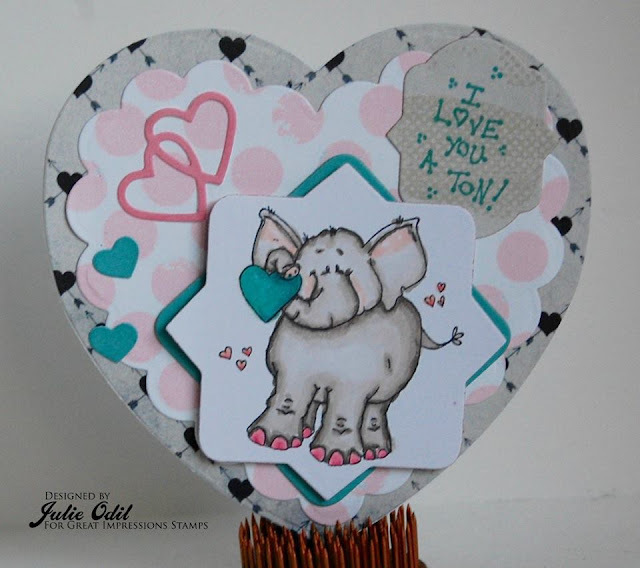 Today's card was created by Julie and features the adorable Heart Struck Elephant (F571) and A Ton Sentiment (B238) available at Great Impressions Stamps. That elephant is so adorable! I love the shaped card, and design. Good morning! This week we are Revisiting Valentines Day Projects created by various Designers. Today's card was created by Ruza featuring the adorable C494 Heart Filled Puppy and F626 Swirly Valentines stamp available at Great Impressions Stamps. That puppy is so adorable! I love the DP she used and how he is sitting in the middle of the circles die. The design was continued on the inside where you find the sentiment. Good morning and Happy Holidays! Today we are taking another look at all of the beautiful cards that our Guest Designer Tammy shared with us this month. 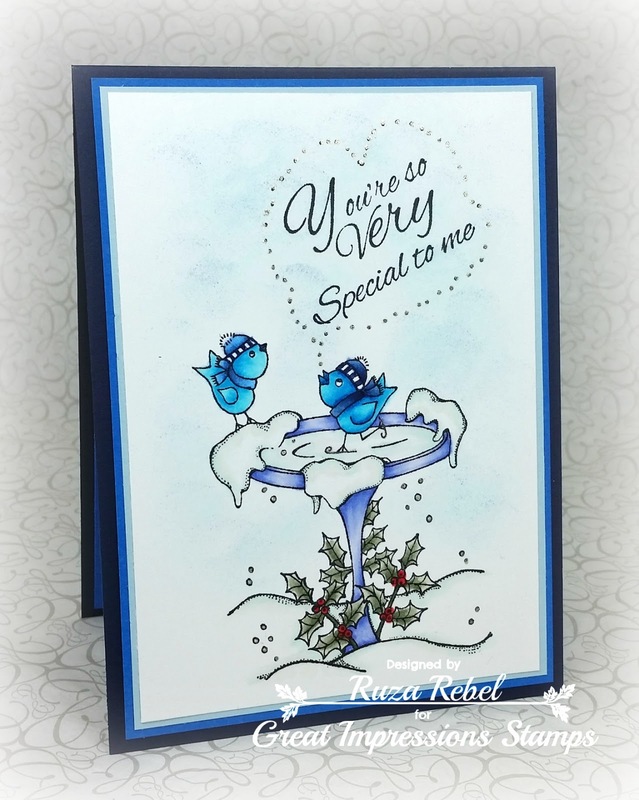 First up is the gorgeous card that Tammy made for our January Color Challenge. I love how she used the colors and her design. Next, Tammy combined some lovely papers that go beautifully with the image for her Valentine's Day Card. Tammys's final card is this adorable Birthday Card. She did an awesome job coloring these friends, and combining the colors in her background. It has been a pleasure having Tammy share her projects with us this month. You still have time to join in our Great Impressions January Color Challenge! Hop on over for all of the details and join in the FUN! Hello everyone! Hope you are having a fabulous year so far! Robin here to once again share my card with you. This is the card I made for our challenge this month. I am trying to get a head start on my Christmas cards for this year. I used Snowflake Dove (H277) for this card paired with a sentiment I made on the computer. I'ts such a beautiful stamp. I then did some distressing around the edges and put it with some design paper, pearls and a bow. You still have some time left to enter our challenge. This month is a color challenge. The prize is this adorable stamp. Just so cute!! I hope you can join in with us in the January Color Challenge. I am here today to remind everyone about our January Color Challenge that is still going! 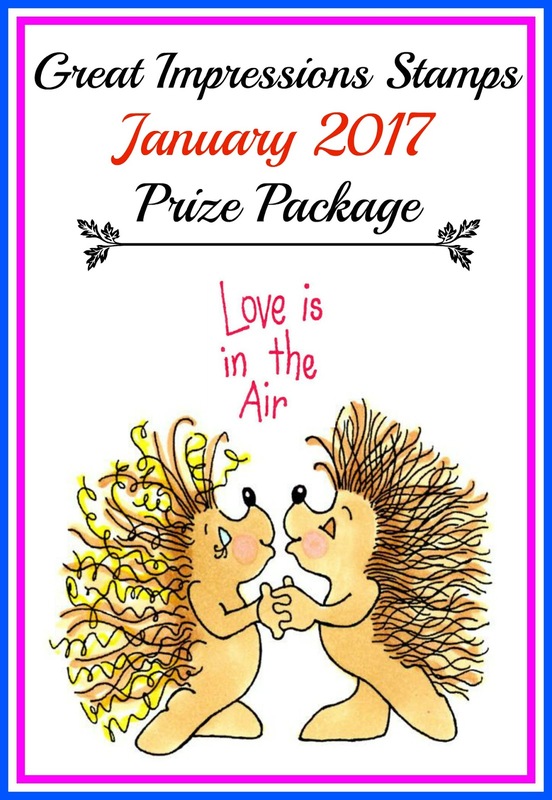 We have loved seeing all the entries so far and would love to see even more! Here is another look at the card I made. I used a variety of different papers to match the blues in the picture. These colors remind me of winter. I have a family member with a birthday in January, so I thought this would be a perfect birthday card for her! I loved the "Fun Coffee Cup" (Item #H278) which I stamped in black ink and then colored in with a variety of grey and blue Copic markers. I added the "Triple Birthday Wish" sentiment (Item #D513) in Soft Navy ink. For the "whipped top" I just swirled around some white acrylic paint on top and then sprinkled some glitter over it. Once that was all dry, I add some light blue stickles for just a bit of extra fun! We have a great prize package available for a lucky winner as well! Good morning! Ruza here to share a card featuring a couple Great Impressions Stamps. Today's card focus is the adorable Happy Toons (E525) which I paired up with the Wishes & Sparkles Sentiment (F312). This card was made for a friends father who turns 80 today. My daughter adores him and will be sending off this card with lots of love. I colored the image with my Copic Markers, fussy cut him out and put him on the side. To add a little dimension to the adorable mouse I stamped him a couple more times so that I could paper-piece the shirt, bow-tie and hat. 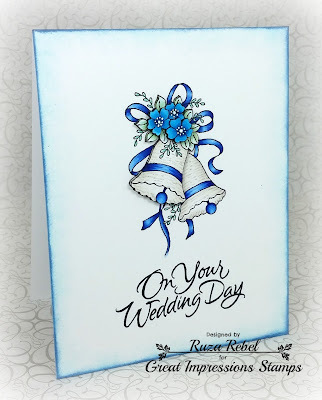 The sentiment was stamped on to light blue cardstock, layered onto more blue cardstock, and then on my white base and blue card. Tim Holtz Distress Ink was applied for the sky and ground cover before I added the mouse using 3D Foam Squares. Blue Stickles was applied to the birthday hat and the center of the bow. I finished the card with the Dropping In (B139) to wish you a Very Happy Birthday on the inside. My colors, except for the ground cover, where pulled from this months Great Impressions Color Challenge. I hope you stop by for all of the details, join in the FUN! Good morning all. 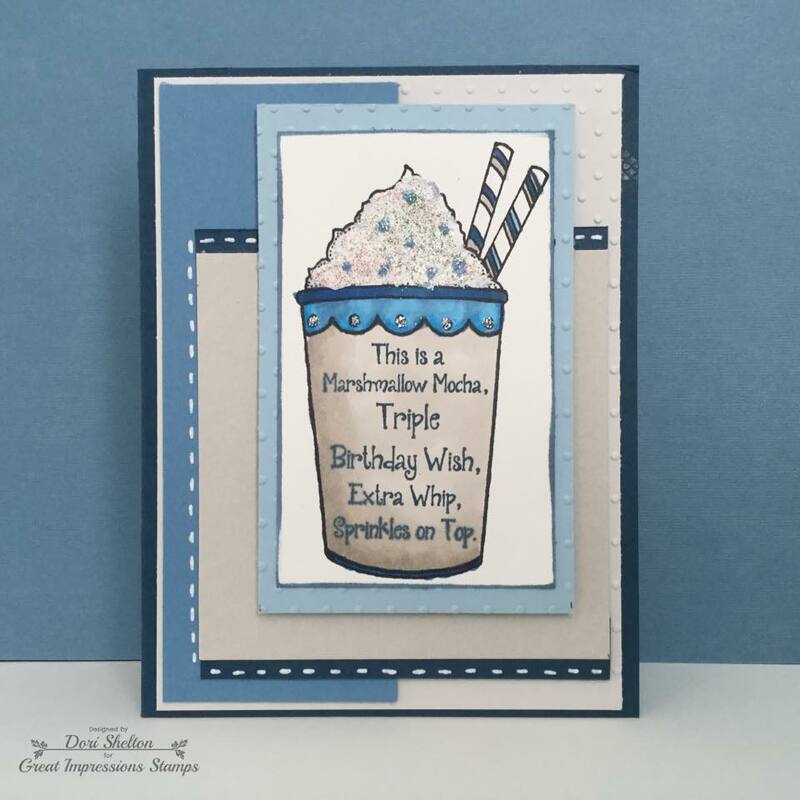 Our January Guest Designer Tammy is joining us today with a gorgeous Birthday Day card. Tammy's card features the adorable Birthday Friends (G505). Here's what Tammy has to say about her card. This image is sooo cute and was fun to work with!! I didn't have a GI birthday sentiment so I left that off. The Birthday Friend's is stamped with Memento Black ink, colored with Copic Markers and I added a bit of shading with Prisma pencils. I used several pierced & dotted dies, and to finish it up I added White Nuvo Crystal Drops. Such an awesome card! I love the background, and how Tammy colored this adorable image. Make sure you stop by Tammy's Blog for more details, and don't forget to leave her some love. Out Great Impressions January Challenge is live! Hop on over for all of the details, and join in the FUN! Good morning everyone! Robin here. We are almost halfway through this months challenge and I have another card to show you. 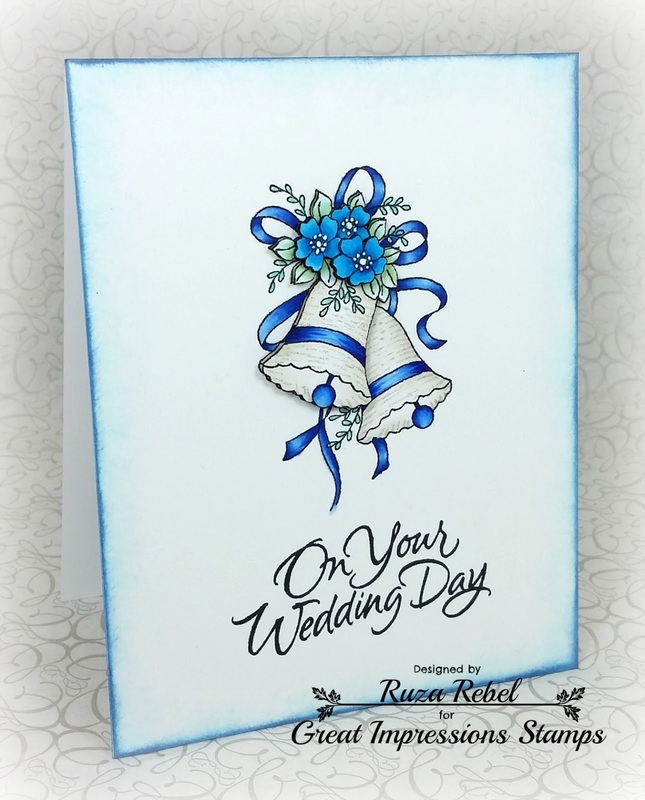 With this card I am using Wildflower Silhouette (H184) paired with the sentiment Being You (D509). I made a background with some watercolors and then stamped the flowers a few times across the page. After that I stamped the sentiment on top, added some sequins and finished it off with some shimmer mist. 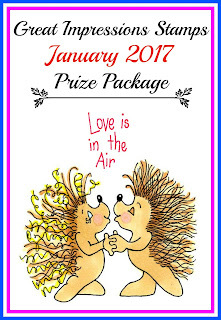 We would love it if you will join us this month in the Great Impressions January Challenge. Don't forget if you use a stamp from Great Impressions leave us a comment and you can double your chances of winning. I hope you're all having a great week. Thank you for stopping by today. 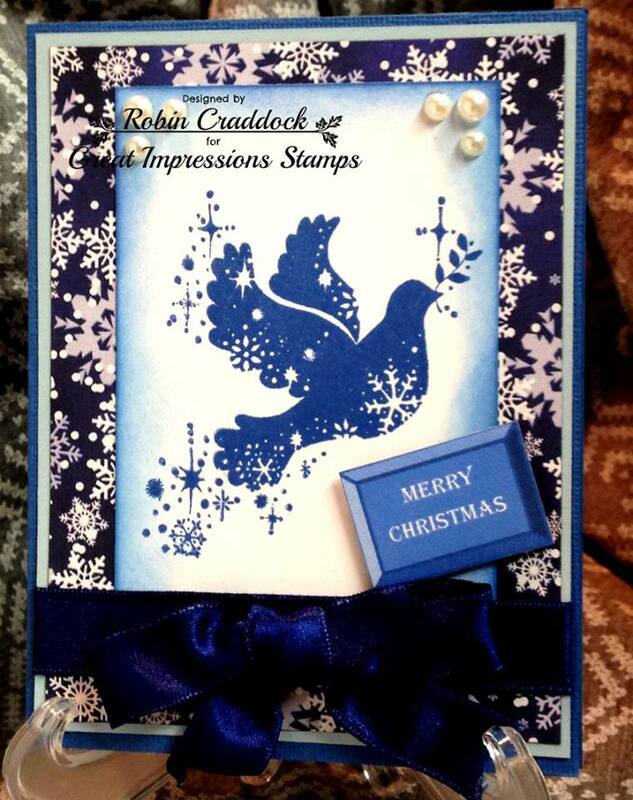 I am sharing another card using some fantastic Great Impressions stamps. With winter still holding many in its grip, I thought it might be nice to share a brighter more colorful card today. I really like how this sentiment called "Happy Day" was perfect nestled in the center of this beautiful "Spring Floral Border" stamp. I used a spring color palette of blue-greens, pink, green and Kraft to complement the colors I used for the flowers. I stamped the sentiment using Audrey Blue ink and the image with Archival Jet black ink. To color in these delicate flowers, I decided to use some Prismacolor pencils. I layered the card as shown and added some white stitching lines and some natural twine for a simple way to finish the card and keep the focus on the beautiful stamp! That is all for me today except a quick reminder that our January Color Challenge is still open! Come on over and link up your cards. We love seeing what you create! 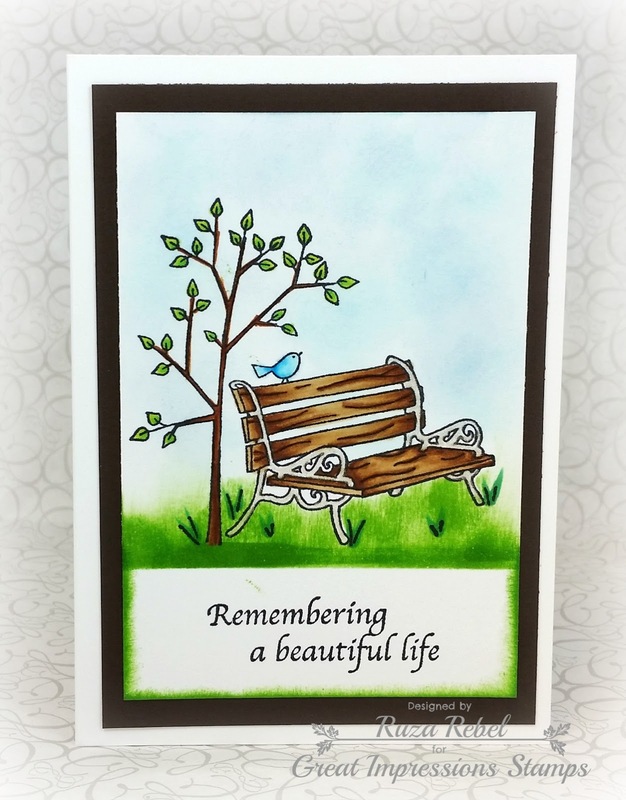 Today's card focus is the cool Park Bench (G493) which I paired up with the Beautiful Life Sentiment (B205). This pairing is beautiful for a sympathy card, so I chose an A-1 cardbase. Mind you, I love the pairing and it was not made because of a loss. I colored the image with my Copic Markers. Tim Holtz Distress Ink was applied for the sky and grass, and around the edges of the sentiment. Since I couldn't find my silver pen I used a Clear Star Gelly Roll Pen for the bench brackets to give it a silver look. I layered my colored panel on brown cardstock, and then my cardbase. We have a NEW Great Impressions Challenge for you this month. I hope you stop by for all of the details, join in the FUN! Good morning all. 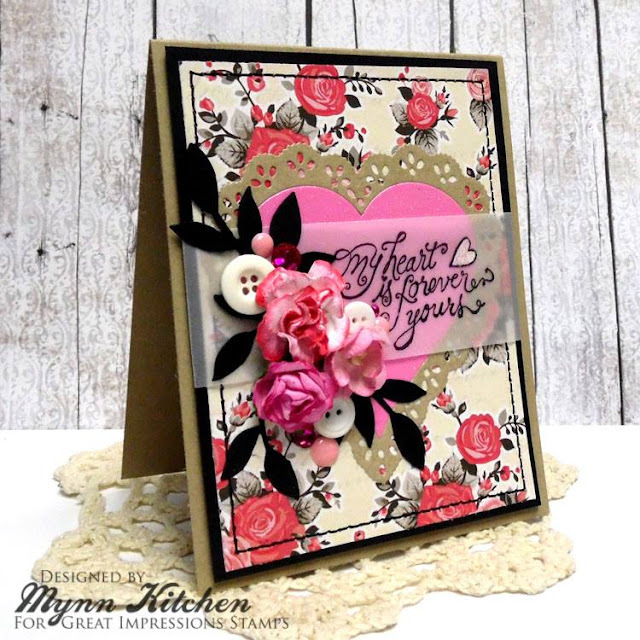 Our January Guest Designer Tammy is joining us today with a gorgeous Valentine's Day card. Tammy's card features the adorable Love-able Owl (8123) with the Love is in the Air Sentiment (8130). The Love-able Owl is stamped with Memento black ink onto cream cardstock and colored with Copic Markers. 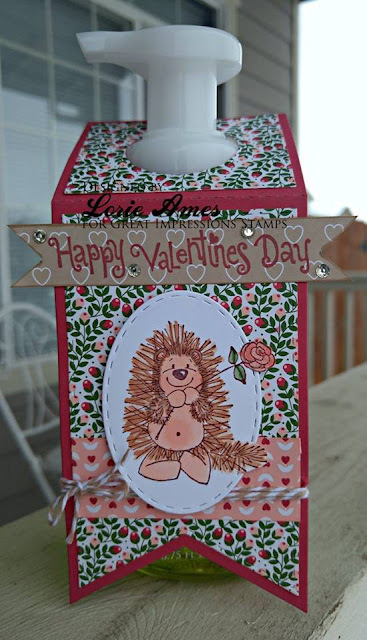 I used a couple of Valentine patterned papers and added a dotted scalloped border. All of the edges were distressed and to finish it up I added some sequins. Such an awesome card! 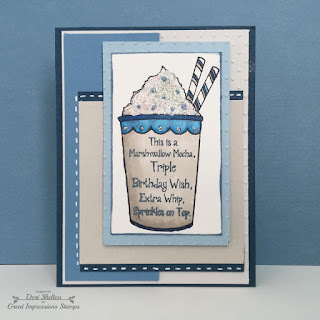 I love the combination of patterned paper that Tammy used for the backdrop of her card! Make sure you stop by Tammy's Blog for more details, and don't forget to leave her some love. Hi All! Robin here with my first DT post. I am so happy to be joining the Great Impressions Design Team! I have some new inspiration for you. I am using Someone Like You (H257) and Elegant Cupcake (D413). I think these two stamps pair really well together. There is a birthday girl out there that really loves pink and black so those are the colors I picked. I hope she loves this card. I embossed the sentiment and colored the cupcakes with my Copic markers. The January Great Impressions Challenge just began this week. I hope you will pop over and check out the details. If you're using a Great Impressions Stamp don't forget to let us know and add it to the Customer Gallery. I hope you're having a great day. I am here to share a card I made using some super fun stamps from Great Impressions. I used Retro Spirals stamp to create a fun background on a Kraft card base. I really like the effect of stamping colored ink on Kraft; but I think you have to choose the right colors to get a good result. I chose a dark blue, purple and green. I added the white swirls myself with a white gel pen just to fill in some of the empty space and I also liked the white on the Kraft as well. I added some stickles to the centers of each of the spirals for a little sparkle. For the sentiment panel I wanted to do something simple so as to keep the focus on the background. I used Tags Stamps which has a variety of sentiments in it. I chose the thank you stamp which I stamped in purple on white card stock and then layered it on to some Navy blue and dark green card stock as shown. I added some faux white stitching lines and then rounded the corners to finish off the card. Also, don't forget to play along with our January color challenge. There's still plenty of time to link up your creations. We can't wait to see what you make! That is all for me today. Have a great day and I will see you all again soon! Good morning and Happy New Year! 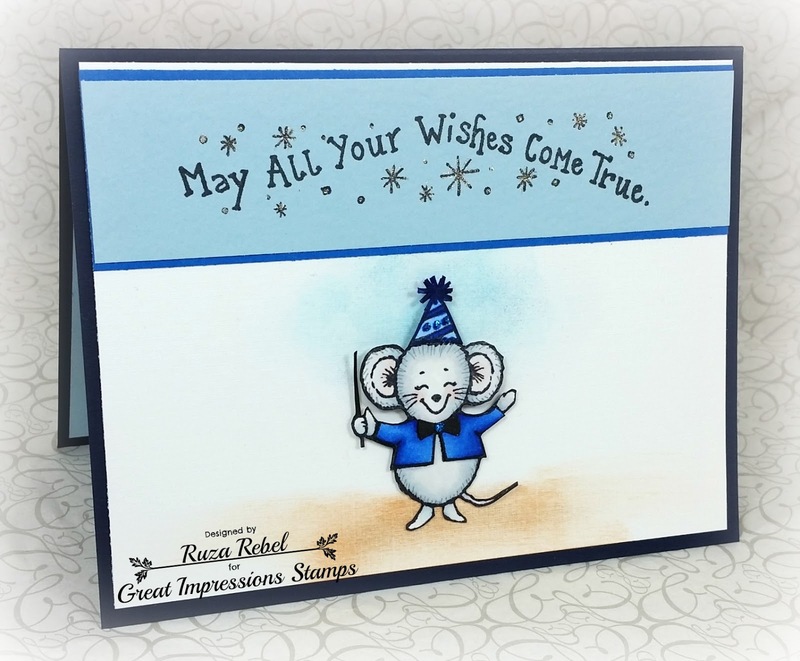 Ruza here to share a card featuring several stamps from Great Impressions Stamps. Today's card focus is the adorable Christmas Bird Bath (H289) which I paired up with the So Very Special Sentiment (D500). Instead of making a Christmas card I went for a Winter Love card. I colored the image with my Copic Markers. After adding the sentiment I free-handed a bubble around the sentiment ... I need more practice doing this. 😆 Tim Holtz Distress Ink was applied around the image, and then I used a Clear Star Gelly Roll Pen for the snow, ice-skates, and the bubble. Once complete, I layered the panel on different shades of blue cardstock. We have a NEW Great Impressions Challenge for you this month. My card was inspired by the colors in our January Color Challenge. I hope you stop by for all of the details, join in the FUN, and if you use Great Impressions Stamps we'd love for you to link them up in our Customer Gallery! Good morning and Happy New Year to one and all!!! Welcome to another monthly Challenge here at Great Impressions! We are stepping away from the "Anything Goes" Challenges at this time. This month we have a "Color Challenge" with a LOT of amazing Inspiration for you. Let's give a BIG Welcome to our Guest Designer Tammy. Tammy will be sharing her creations during the Month of January with all of us. Hi, My name is Tammy. I live in Colorado with my wonderful husband and our two fur-babies! I've always had some kind of crafty thing going on in my life. But, when I started to make cards I knew it was the perfect craft for me because I love to color and create with paper. I think the best way to describe my style would be... bold coloring with mostly "cute" images and I love my die cuts! :) I also enjoy cooking, hiking, camping and spending time with my family and friends. Now let's see what Tammy created to inspire you! Tammy did an amazing job coloring the adorable whale, add in the DP and flowers for an awesome card. Make sure you head over to Tammy's Blog to leave her some love. Our NEW Designer's would love to hear what you think of their projects. 01/06/17 Update: I am sorry to inform you that the Customer Gallery has been closed. With this being the case I removed the Customer Gallery Badge from the sidebar.